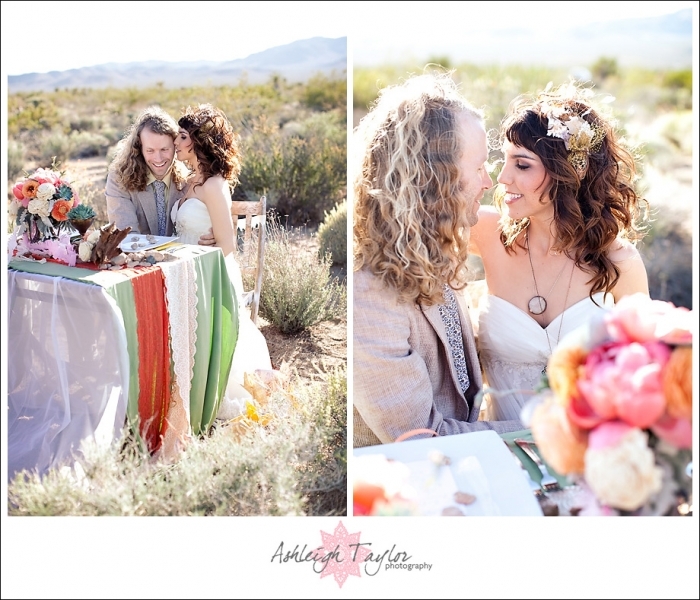 I am so thrilled to finally be able to share this amazing desert and hippie inspired love shoot with you, which was featured on Style Me Pretty last week! This whole thing came about when I met Jackie. I met her at a bridal show when she stopped at my booth and I instantly LOVED her. She had the cutest personality and sense of style. Apparently the feeling was mutual and soon we were meeting over coffee and talking weddings and photography. Jackie told me how she is getting married in her hometown of Chicago this fall and (bummer) had already hired a local photographer to shoot it. 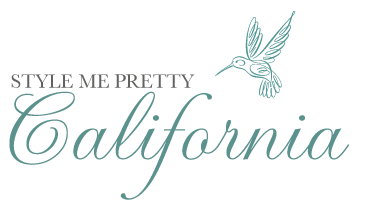 Though she is crazy excited for her Chicago wedding, she was an avid Style Me Pretty, Green Wedding Shoes, and Once Wed reader and had just been dreaming and swooning over the idea of a California wedding. She even had some dream vendors lined up for it, like florals by Honey and Poppies. She knew two full blown weddings weren’t in the budget…but perhaps a styled Mr. & Mrs love shoot could work! Jackie and her charming fiance Tony are uber hip and stylish. They look like modern hippies and ooze that relaxed cool vibe. I helped them translate that vibe into a lovely Hippie inspired shoot out in the desert…Joshua Tree to be exact! And since it was to be a mini, California dream wedding, we HAD to have Jackie’s dream florist make the arrangements. As usual, Megan of Honey and Poppies knocked it out of the park and created some swoon worth florals! 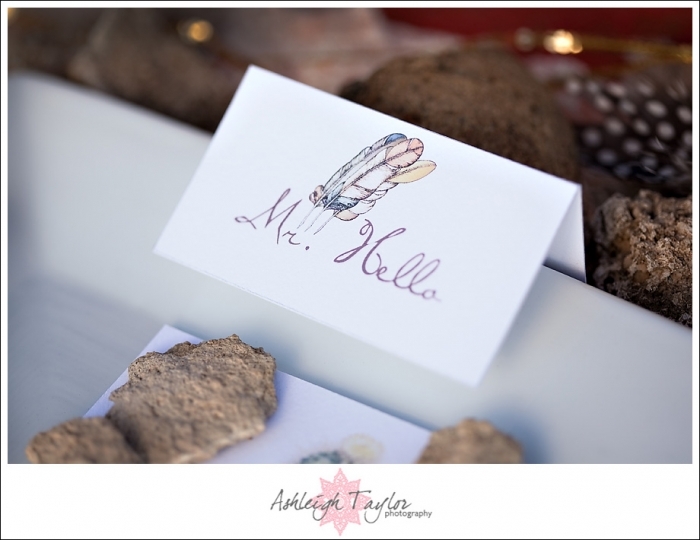 My love, Amber, of Pitbulls and Posies created some amazing stationery for the shoot! Hope Stanley chose the perfect look for Jackie to wear. And Jackie’s headband was made by the always breath-taking Lo Boheme!! The talented Susie Chhuor Studio completed Jackie’s look with amazing hair & make up (though the desert wind sure did seem determine to mess up Jackie’s hair all day!). Lastly, I asked my friend Candice to come along and help me style the shoot! All in all it was a dream team, and Jackie’s reaction to the final set up was one of pure joy! She told me it was all she wanted and more and that she was so happy to be getting her dream California wedding! Hooray!!!! I’m so excited to share these photos with y’all! They are some of my faves to date! Hugeeee thank you to all the amazing vendors who worked on this shoot! The sweetheart table was TO DIE FOR!!!!! The stationery Amber made had the CUTEST motifs! Feathers & cactus! LOVE! I loved the brass containers Megan used to show off the different blooms and succulents! So lovely! Brides hoping to create a similar look should ask their florist if they can provide such containers and/or start going to flea markets and thrift stores throughout wedding planning to collect the goodies! These details?? SWOON!!!! I LOVE that Tony wore a light colored suit! And I loved Jackie’s look of layered necklaces and bangle bracelets! While traditional diamonds and pearls make lovely wedding day accessories, I think it’s really fun to see colored stones (turquoise!!) and a funkier approach to jewelry! There are literally a MILLION reasons why I love Megan’s floral arrangements. Reason #18976? She wrapped this bouquet with crepe paper streamers!! Ahhhh! Jackie & Tony you are too cute for words!!!!!!! I’m literally SPEECHLESS! These two are so flirty cute together! LOVES it! We DIY’d ribbon wands for this shoot! (Which takes like two seconds and basically involves tying ribbon to a stick just fyi). They really made for some FUN photos! Puttin’ that desert wind to good use! In addition to a sweetheart table, we created this little lounge area so the two could just relax and enjoy each other. This is Jackie + Tony being themselves! Laughing and just living in the moment! Check out all the photos from this shoot on Style Me Pretty! Mai - so seriously cute!!! fantastic florals (those ranunculus are crazy!) and i LOVE the paper Amber Moon! Jaqueline Faria - these are gorgeous! Jenny - Hello there! I absolutely love this shoot you did! I have a few questions to ask you, as I will be doing a shoot at Joshua Tree National Park this July. What month was this shot? I’m a little worried July might be too warm to do a shoot at Joshua Tree, but see that this photo shoot was done in July? Also, is the florist that you worked with near Joshua Tree? Was transporting the flowers difficult?